These days, you don’t need a set-top box, satellite dish or cable TV to be able to enjoy the newest television series and box office movies. Instead, you can sit back and relax with your friends and family at home (or even outdoors on the patio) and take advantage of the newest streaming technology from Netflix, Amazon Prime, and Sky Q. However, with the constant improvements in graphics quality, it doesn’t make sense to gather everyone into a small space to watch your chosen programme or film when you can stretch out and see everything on the big screen instead, complete with superior surround sound. 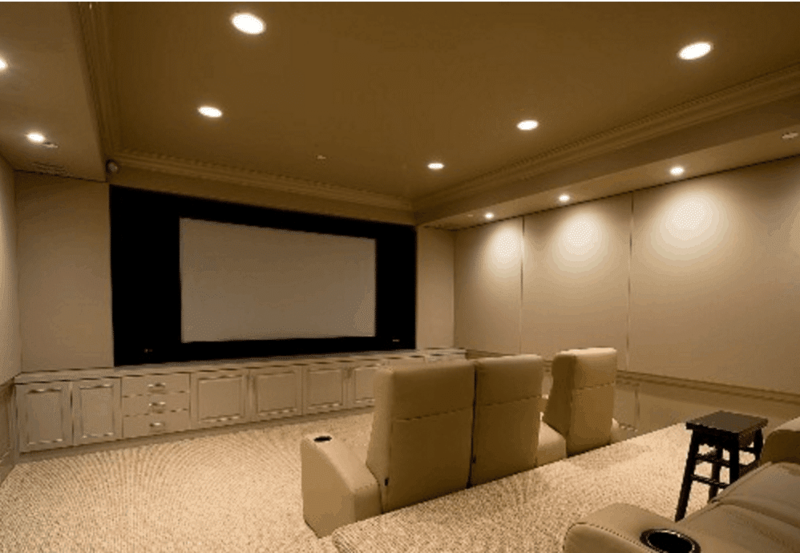 This is where Rococo Systems can help by installing your dream home cinema system. We’ve got over two decades of experience in home cinema installation throughout Essex and, as we don’t believe that one size fits all, we can even design you a bespoke system that fits your needs to a tee. Not everyone wants to head to the cinema to watch films, particularly now that the 21st century has brought us flat-screen TVs of up to 110 inches that can be wall-mounted, placed on a traditional TV stand or even discretely concealed within a cupboard or recess until you want to use it. The prices of televisions and surround sound systems have also significantly dropped due to the ever-changing nature and competitiveness of the home electronics industry. However, as many people have found out the hard way, installing your own home cinema isn’t as easy as it looks. Plus, the typical off-the-shelf systems you find in electrical retailer chains aren’t uniquely tailored to suit particular rooms in your home. Instead, they’re mass-produced on large assembly lines, and often lack top-quality components. What’s different about Rococo Systems is that we offer a comprehensive home cinema installation service to customers across the Essex area, using leading brands to create the perfect set-up for your living room, lounge, bedroom or even garden. As home cinema installation experts, we can help guide you through the process of creating the perfect cinema system by demonstrating and advising you on the latest technologies and control options. When you visit Rococo Systems in our Essex store in Ongar, one of our experienced members of staff will give you as much time as you require to understand and clarify your requirements, and provide you with as many suitable options as possible to fit within your budget. We also offer a design service where we can work alongside your builders, architect, interior designer or cabinet maker to create you a custom-made cinema theatre that will enable you to relax and enjoy watching movies with your friends and family exactly the way you want to. Our home cinema installation team has created a variety of set-ups for our clients in Essex over the years, from dedicated home cinemas boasting giant screens, comfy seats, and superior sound systems, and concealed home cinemas, where both the screen and projector are concealed inside the wall or ceiling, to outdoor cinemas that give the wow factor to patios, terraces, and gardens. Plus, our design team are dab hands at creating lighting systems which add the finishing touch to your home cinema and provide the perfect mood for every occasion. Find out more by visiting Rococo Systems at Moreton Road, Ongar, Essex, CM5 0LU, calling us on 01277 890 888 or submitting an online enquiry today.